Calls over the Internet has established itself thanks to free voice chat services such as Skype, Google Talk or iChat as a cheaper alternative to traditional telephone conversations in the network. But this is only one of several ways, through Voice over IP (VoIP) over the broadband phone calls to internet line while saving money: by software on your PC, laptop or smartphone, with a special IP phone, the SIP to Standard support, or with the conventional telephone connected to a VoIP adapter or VoIP router. The possibilities for the use of VoIP, ranging from occasional conversations via voice chat and the realization of the entire telephony including accessibility on a regular local number. We therefore declare the following pages, what to look for going into Internet telephony. Who sporadic call via VoIP software with a PC or laptop, the range of the built-in most devices speakers and microphones. For more convenience worth at more frequent phone calls but a headset or telephone. A voice chat feature is now used for most instant messengers integrated. Not all of them can come up with a softphone feature that also allows calls to regular landline and mobile lines. Regardless of the devices used, the user needs for the Internet telephony a broadband connection, to obtain a sufficient sound quality. Importance is especially the velocity at which the data is sent, that is the so-called upstream speed. This is with the conventional retail terminals significantly lower than the velocity in the downstream. To ensure adequate quality in telephony and simultaneous Internet surfing, the broadband connection should have a minimum upload speed of 128 kbit / s.
Internet telephony provider lure users with free calls. While making phone calls over VoIP is not really free, since at least the basic cost of the necessary Internet access charges, such as DSL or cable TV. Moreover, if not reached the entire connection via the Internet, but as a call to the traditional telephone network is to a landline number, so also are in addition to the minute prices of a VoIP provider. But cheap calls as the open call by call are always there. This makes VoIP a practical savings option for households with telephone connections, in which the use of call-by-call is limited. 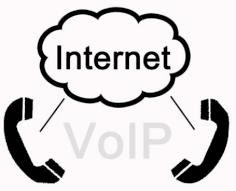 Another advantage: because the VoIP connection is linked to the Internet, users are theoretically accessible anywhere in the world with the same number and can, for example, calls from overseas home at local rates lead (nomadic use). With the right app can also be the smartphone for VoIP client are.